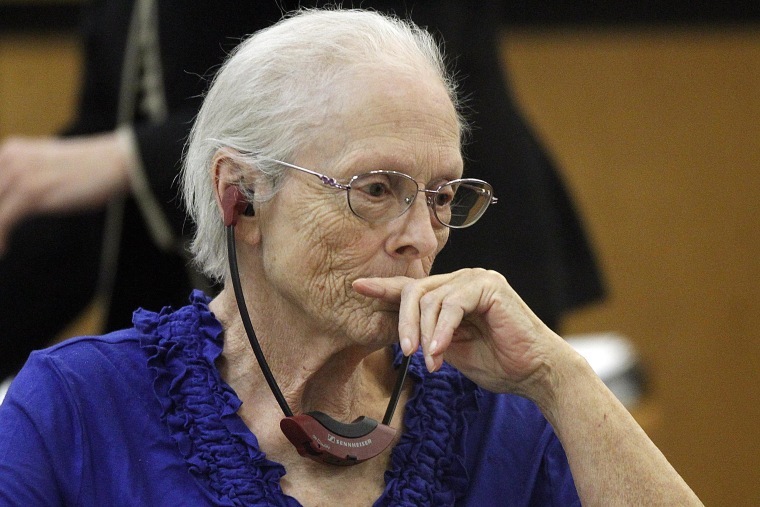 A 75-year-old Missouri woman accused of shooting her husband in Wyoming almost 40 years ago was found guilty of second-degree murder Thursday in a case that hinged on whether jurors believed her claim she was defending their 2-year-old daughter. Alice Uden faces 20 years to life in prison after being convicted of the lesser charge. The jury found her not guilty of first-degree murder, which would have carried a life sentence. "We are pleased with the verdict," Laramie County District Attorney Scott Homar said. "The jury made it clear that they believe she at least purposely and maliciously killed the victim in this matter." Sentencing will be scheduled later. Investigators recovered Ronald Holtz's remains of last summer from an abandoned mine shaft on a small cattle ranch between Cheyenne and Laramie. The discovery led to the September arrest of Uden, who was his wife at the time, and her current husband, who was charged separately with killing his wife and two children. Police have never linked the two cold cases that brought the pair who were quietly living out their senior years in the rural Ozarks near Springfield, Mo., to Wyoming to face criminal charges. Prosecutors could not mention the husband's case during the trial. Uden, of Chadwick, Missouri, testified she shot Holtz in the back of the head sometime in late 1974 or early 1975, just as he was about to attack her 2-year-old daughter in her crib. But prosecutors said Uden shot Holtz while he was asleep, and they played audio and video recordings of her interviews with police to show jurors her story had changed. Uden testified that after she shot Holtz, she emptied Christmas decorations out of a 55-gallon cardboard barrel and stuffed Holtz's 175-pound body inside. She rolled the barrel onto the trailer porch and into her car trunk. She said she drove the barrel to the Remount Ranch, where she and her second husband were caretakers before he died in 1973. Her trial featured emotional testimony from one of her sons, who said last week that Uden told him in the 1970s that she killed Holtz as he slept. At one point during his testimony, Todd Scott turned to his frail mother seated in a wheelchair and said: "I hate you."